National Bulk Equipment, Inc. (NBE). NBE has introduced an automated, bulk bag filling system specifically designed to ensure extended duty cycles in extremely demanding operating environments. This NBE bulk bag filler is built on a corrosion- resistant, hot-dip galvanized, stainless steel and carbon steel structural framework. Component assemblies, such as the hydraulic and pneumatic systems, are also constructed of stainless steel and have chrome-coated rods and subassemblies to ensure long-term resistance to corrosion and oxidation. Automation controls, system utilities, and connectors are hermetically sealed to prevent damage from contact with liquids and material contaminants. The PLC and HMI enclosures are 304 stainless steel, NEMA Type 4X, and are coated with a two- part epoxy finish. The PLC and HMI enclosures are each independently air conditioned to eliminate the buildup of internal condensation. The application-specific design and construction of this NBE, integrated bulk bag filler ensures accurate, reliable, and repeatable operation at process rates of up to 30,000 pounds per hour. bag weight. 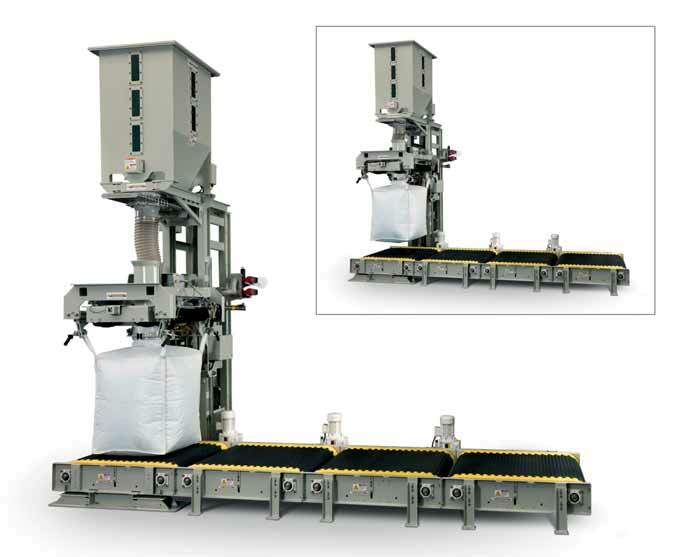 To make certain each bulk bag is filled to a dense, stable, and safe load, this NBE bulk bag filler has an automated densification platform, isolated from the framework deck, that during the filling sequence directs 3 Gs of high-speed, low- intensity vibration to the base of the bag to evenly settle material in the bulk bag. Following the fill and weigh stages, a 5,000-pound capacity accumulation conveyor automatically removes filled bulk bags from the filling sequence and stages the bags for retrieval. The carbon steel structural framework of the conveyor is hot-dip galvanized and treated with a two-part epoxy surface finish to provide system-wide resistance to the corrosive environment and harsh process materials. Rigorous risk assessment procedures, implemented by NBE, identified aspects of the application that led to the integration of process safety performance improvements such as the NBE cantilevered fill head/bag hanger carriage design, with pneumatic actions that bring the fill head and rear bag hook to well within the operators reach. This ergonomic, NBE design eliminates the need for the operator to step or lean into the equipment and enables the operator to maintain an optimal posture for safe and efficient operation. This NBE bulk material filling system enables processing and packaging operations to run production at designed speeds, even in harsh application environments, without concern for undue equipment maintenance, material waste, package re-work, or additional labor costs and risks common with under-performing equipment.